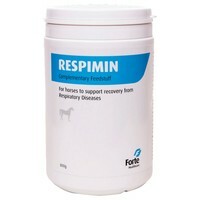 Respimin Respiratory Equine Supplement is used to metabolic and respiratory functions in horses. Respimin can be used to help horses recover from other viral respiratory diseases, respiratory allergies and Chronic Obstructive Pulmonary Disease (COPD). Respimin is suitable for helping horses recovering from respiratory diseases, such as acute, sub-acute and chronic Bronchitis, Bronchiolitis and Bronchopneumonia. Cold, fog, dust and wet can disturb and upset normal respiratory and metabolic functions in horses. Respimin provides your horse with nutritional elements found in plants growing in these places and can be successfully used for maintaining their general metabolic support. Respimin should be mixed with your horse's feed once a day full dosage instructions available in the manufacturer's guidance or by consulting your Veterinary surgeon. Mixture of macro- and micro-elements, sea salt and selected herbal ingredients (high altitude herbs).